One of my children’s favourite décor items is a mirror ball. Sure, it is left over from my ‘bachelorette pad’ but rather than get rid of it, I installed it in the boys’ room. They regularly close the curtains, get their torches out (to create the all important spotlight) and watch the reflections bounce around the room. My husband is mildly concerned about the long term effects of too much disco but I’m of the opinion that a little Saturday Night Fever never hurt anyone. 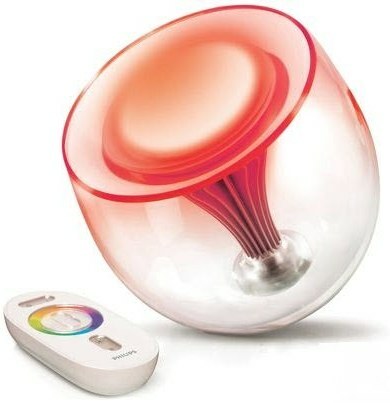 I would love to up the ante with The 16 Million Colour Lamp by Hammacher Schlemmer. With the use of red, blue and green LED globes, the lamp produces over sixteen million different colours of accent light. Colour saturation and brightness can be adjusted and you choose your shade simply by scrolling through the colour wheel on the wireless remote control. The lamp can also be set to automatically cycle through soft, muted tones and deep, bold shades of light. Whilst I have never explored the benefits of colour therapy, I am sure a calming blue hue at acid hour would not go astray and equally a cheery yellow would be a good way to start the day. The lamp is US$199.95 and is available from Hammacher Schlemmer. Whilst you are there, take a moment to look at some of their other curios including underwater pogo sticks (?! ), luminous bocce sets and an authentic Boardwalk Photo Booth (for a cool US$11,000). Hammacher Schlemmer ship internationally.